Image: D'Munchies/Facebook/Original photo was cropped but not altered for this article. 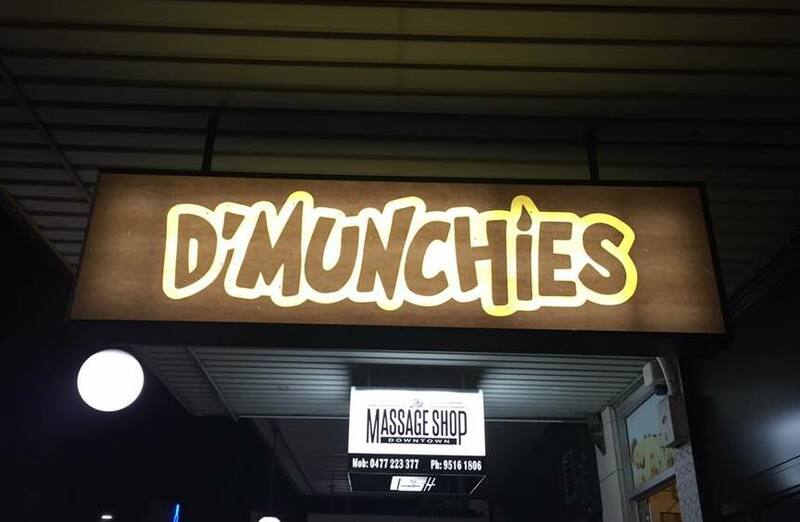 In what is some seriously good news for ganj lovers Down Under, a new stoner café in Newtown, Australia, opened Tuesday at 4:20 p.m., with a menu that makes your standard stoner fare look like the pile of disgusting slop it is. D’Munchies, in New South Wales, is the brainchild of veteran chef David Pyne, who is not even playing with you. Without explicitly calling the place “an excellent spot to pair dank strains of hybrid with food you can’t find in a vending machine,” he’s pretty sure the massive MJ-themed mural and offerings like pepperoni pizza hot dogs and pretzel-crusted ice cream will attract a certain type of clientele. By that we of course mean stoners, because, come on, look at that thing. And we’re of course not saying you have to be high to enjoy such delicacies as the J-Rizzler Chicken N Cheetos Burger, which features fried buttermilk chicken, bacon, hash browns, Cheetos cheese sauce and lettuce on a milk bun, but oh my God that sounds like it would be so good if you were. So too with something called a Hot Bush Doughnut, which is a fried morsel of deliciousness with Nutella, lemon curd, sprinkles or PB&J and optional ice cream. Pyne told Broadsheet that this isn’t just a case of throwing a bunch of standard munchie fare together with no regard to whether or not it’s actually, you know, good. He’s probably on to something. There’s evidence that after a little bit of good old-fashioned spliffage, the THC in marijuana starts working on your appetite in three ways: It stimulates your olfactory gland, which means food smells and tastes better when you’re high; it gives you a little jolt of dopamine while you eat, which makes eating itself a pleasurable experience; and finally, there’s evidence to suggest that it — duh — stimulates your appetite. So what looks like a mishmash of crazy stoner food at first might just be a masterpiece of smells, tastes and textures to make your bowl of post-bowl fried pumpkin ravioli nachos into a literal feast for the senses. But honestly, do we really care about all the science between what makes us hungry when we’re high? Or do we care that, when we are toasted, we can go to a café like D’Munchies and get something called a Bone Cake, which is a beautiful herb-friendly oeuvre of caramelized banana, whipped ricotta, cinnamon spiced pistachios, butter roasted walnuts and manuka honey? Pyne expects that he’ll get a lot of carryout business at D’Munchies, because yes, eating all this stuff in your jammies with an episode of Archer and a well-worn Snuggie is basically as close to heaven as you’ll ever get while you’re alive. Unfortunately, if you live in the U.S., you’ll just have to salivate wistfully and hope some enterprising canna businessman or woman comes and offers their own version of the pepperoni pizza hot dog.